Totodile in game: 6,666 Who? Important notice! Pokemon Totodile is a fictional character of humans. Totodile (Japanese: ワニノコ Waninoko) is a Water-type Pokémon introduced in Generation II. It evolves into Croconaw starting at level 18, which evolves into Feraligatr starting at level 30. 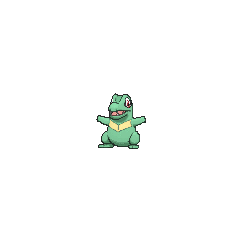 Along with Chikorita and Cyndaquil, Totodile is one of the three starter Pokémon of Johto available at the beginning of Pokémon Gold, Silver, Crystal, HeartGold, and SoulSilver. Totodile resembles a bipedal, blue crocodile with red spines on its back and tail. The spine on its back is larger with additional ridges. Totodile's head is large, with ridges above its eyes. Much of the head's size is composed of Totodile's snout and strong jaws. There are two visible teeth on the tip of its upper jaw, and two rows of three teeth on each side of its lower jaw. On its chest is a yellow, somewhat V-shaped pattern that extends to its arms with a line bisecting the pattern. Totodile has five sharp claws and three toes. Its eyes are red and surrounded by a dark blue or black pattern. Totodile tends to be playful by nature, and has a habit of biting anything it sees, including its Trainer. In the wild, Totodile prefers to live along the edges of bodies of water. Ash captured a Totodile in The Totodile Duel, after battling for it with Misty. Ash's Totodile, who had a very playful personality, remained with him throughout Ash's Johto adventures, before being left in Professor Oak's lab while leaving for Hoenn. Wani-Wani is Marina's starter Pokémon that she received from Professor Elm. Another Totodile appeared in An Egg Scramble!, under the ownership of Khoury. It made subsequent appearances in A Rivalry to Gible On! and then later in Bagged Then Tagged! where it evolved into a Croconaw. A Totodile that belonged to Professor Elm went missing in Don't Touch That 'dile. That Totodile found Team Rocket and chomped down on Jessie's hair. Ash and his friendsmanaged to get the Totodile back to Professor Elm. Totodile had a role in Arceus and the Jewel of Life when it used Water Gun to help Pichu get the jail key so it could free Damos. A Totodile also appeared in Meloetta's Moonlight Serenade. 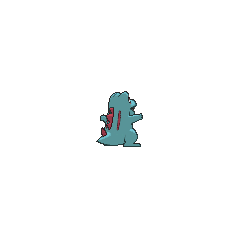 A Totodile appeared in Up Close and Personable!. A Totodile appeared as a plush toy in A Jolting Switcheroo!. EP151 Totodile Ash's Pokédex Totodile, the Big Jaw Pokémon. Its highly developed jaw is so powerful, it can crush practically anything. Trainers beware: this Pokémon loves to use its teeth. DP143 Totodile Dawn's Pokédex Totodile, the Big Jaw Pokémon. Totodile has a habit of using its highly developed jaws to chomp on anything in sight, so Trainers beware. In Magical Pokémon Journey, Pikachu and Clefairy meet a Totodile in The Happiness Clover. Totodile tricks Pikachu and Clefairy into finding him a four-leaf clover, though in the end he admits to tricking them and they become friends. 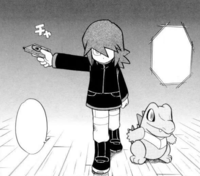 In Pokémon Adventures, Silver stole a Totodile from Professor Elm's lab in Sneasel Sneak Attack which said Totodile first appeared in Murkrow Row. It was then able to evolve into Croconaw after destroying a built-in iron ball trap with Exbo's help, but being left in a coma after his Trainer and Gold's defeat against the Masked Man left it unable to evolve until the fight with an outraged Lugia enticed all three of the Johto starter Pokémon to evolve. With its increased strength and Surf ability, it is the major mainstay of Silver's team. In the Pokémon Mystery Dungeon: Blazing Exploration Team manga, an adaptation of Pokémon Mystery Dungeon: Explorers of Time and Explorers of Darkness, the main character is a Totodile, who teams up with Chimchar to form Team Blaze. Silver has a Totodile which he received it from Professor Oak in Welcome Back, Clefairy!!. Totodile was the only Generation II starter Pokémon to appear only as a random trophy, not in a Poké Ball. Little but feisty is the best description for these Water-type Pokémon. The first thing they do when they see something move is latch onto it with their powerful jaws. Totodile was one of the three Pokémon that Professor Elm offered to Trainers in Pokémon Gold, Silver, and Crystal. They evolve into Croconaw. "A Big Jaw Pokémon. This alligator-like Pokémon stands on two legs. It has a small body but an impressive jaw that boasts potent bite power. It can do serious damage to someone even if it's just playing. Its tendency to chomp down on anything that moves in front of it means Trainers have to be extra cautious around it. When it levels up, it evolves into Croconaw." Pokémon Pinball: Ruby & Sapphire: Totodile will sometimes come down on a rope to replace the Egg on the Ruby Field in place of Aerodactyl. 51%-100% HP Can I bite? Can I really bite? 26%-50% HP Oh, sheesh. I only have half my HP left. Level up I did it! I leveled up! 51%-100% HP Let's give it our best shot, <name>! 26%-50% HP Ouch... I'm starting to hurt. Totodile powerfully spits blobs of water. It may squirt them in succession. Totodile often plays in the Beach Zone. He likes Rayquaza's Balloon Panic the most! 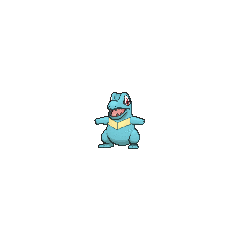 For other sprites and images, please see Totodile images on the Bulbagarden Archives. Totodile is the tallest and heaviest unevolved Water-type starter Pokémon. 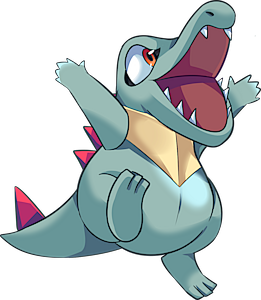 Totodile is based on a baby crocodilian. 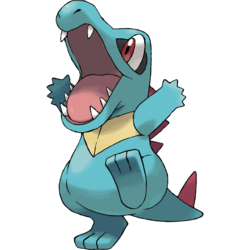 Totodile is a combination of tot and crocodile. Waninoko can be taken to mean 鰐の子 (child of a crocodile/alligator). Cantonese Chinese 小鋸鱷 Síugeuingohk Means "Little saw(-toothed) crocodilian"
Mandarin Chinese 小鋸鱷 / 小锯鳄 Xiǎojù'è Means "Little saw(-toothed) crocodilian"